Researchers from the University of Hawai'i (UH) and NOAA's Office of National Marine Sanctuaries today announced the discovery of an intact "ghost ship" in 2,000 feet of water nearly 20 miles off the coast of Oahu - the former cable ship Dickenson, later the USS Kailua. Launched in Chester, Pennsylvania in early 1923 for the Commercial Pacific Cable Company, Dickenson was part of a global network of submarine cable that carried telecommunications around the world. Repairing cable and carrying supplies, Dickenson served the remote stations at Midway and Fanning Island from 1923 until 1941. it arrived in Pearl Harbor with evacuees from Fanning Island on December 7th, during the Japanese attack that brought America into World War II. 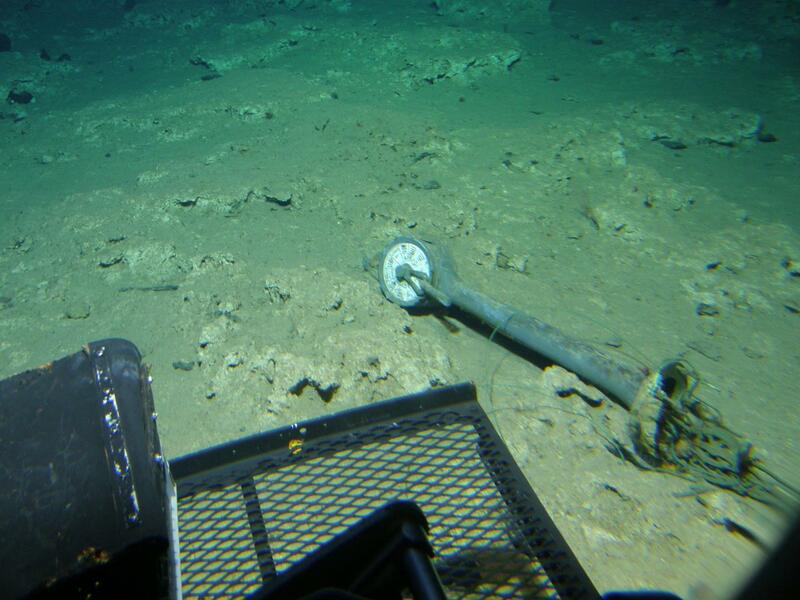 It was found sitting upright, its solitary mast still standing and the ship's wheel still in place, on the seabed last year during a maritime heritage submersible mission with the UH Hawai'i Undersea Research Laboratory's (HURL) Terry Kerby and Drs. James Delgado and Hans Van Tilburg of the maritime heritage program in NOAA's Office of National Marine Sanctuaries. "It is always a thrill when you are closing in on a large sonar target with the Pisces submersible and you don't know what big piece of history is going to come looming out of the dark," said Kerby, HURL submersible pilot. "One of our first views of the USS Kailua was the classic helms wheel on the fantail. The ship was surprisingly intact for a vessel that was sunk with a torpedo. The upper deck structures from the bow to the stern were well-preserved and showed no sign of torpedo damage." "From her interisland service to her role in Pacific communications and then World War II, Dickenson today is like a museum exhibit resting in the darkness, reminding us of these specific elements of Pacific history," said Van Tilburg. Dickenson was used to evacuate company employees from Fanning Island. With Britain at war with Germany and its Axis partners, it was feared the station would be a target, as the company's stations had also been targets for German raiders in World War I. Dickenson arrived at Pearl Harbor with the Fanning evacuees on the morning of December 7, 1941, sailing into a port at war. Some of the evacuees on Dickenson noticed a submarine following their ship, only to see it disappear as U.S. forces attacked the sub and drove it off. The coming of war had implications for Midway, Dickenson's regular port-of-call, and Dickenson. The cable service from Midway out into the Pacific was soon inoperable, and remained so throughout the war. Midway's role as a hub in trans-Pacific communications was effectively over, and a new strategic role, which had been evident in U.S. desires from the beginning of American involvement with the atoll, now assumed prominence. The famous battle of Midway, off the atoll's shores in 1942 underscored that new role. Dickenson, now chartered by the U.S. Navy, entered service as USS Kailua (IX-71) to service cable and submarine nets in the South Pacific until it returned to Pearl Harbor at the end of the war. 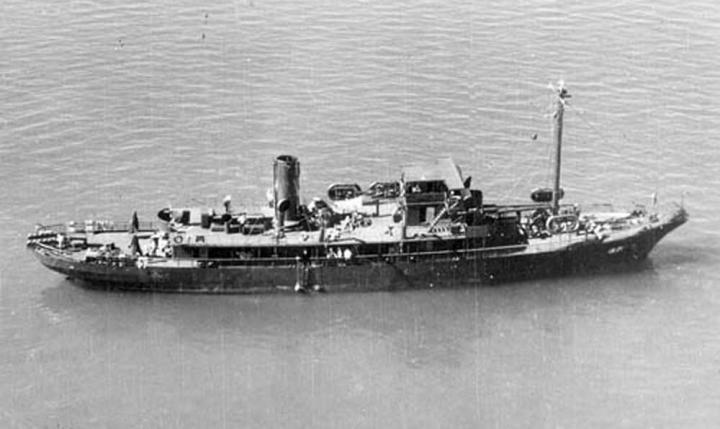 No longer needed by the Navy or the Commercial Cable Company, the former USS Kailua was sunk as a target by submarine torpedo on February 7, 1946. The exact location was not recorded, and the final resting place of the ship had remained a mystery. "Seeing the ship come into view, we were all amazed at its level of preservation - and by the fact that everything was more or less in place. The identification of the wreck was easy, not only because of its unique form, but also because the Navy's identification number of IX-71 was still painted on the bow," said Delgado, director of the Maritime Heritage Program. Detailed analysis of sonar surveys of the sea floor off Oahu by Steve Price and Terry Kerby of HURL has found a number of significant, previously uncharted wrecks that remained unidentified until encountered by HURL's Pisces submersibles. These have included the Japanese midget submarine sunk in the opening hour of the attack on Pearl Harbor, and the massive aircraft carrier submarines I-400 and I-401. The USS Kailua wreck is considered an historic site. "We plan to nominate the wreck to the National Register of Historic Places," noted Delgado. "This unique American ship, vital in its role in keeping global telecommunications open in the first part of the 20th century, is also linked to historically significant Midway Atoll National Wildlife Refuge, now part of Papahanaumokukea Marine National Monument in the National Marine Sanctuary System. Wrecks such as this remind us of special places in the ocean, like the monument, that connect all of us to them as refuges, sanctuaries and museums beneath the sea." There are no plans for a return to the site or any recovery; the wreck owned by the U.S. Government and is protected as Federal Property.